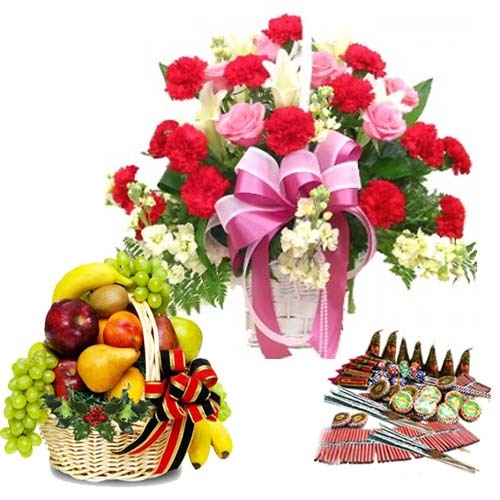 Product Consist : Basket of 25 Mix Flowers like Carnations Roses lilies with green fillers with 5 Kg Mix Seasonal Fruits in Basket along with Assorted Fire crackers (Worth Rs.300/-) (Note: Types of Fire Cracker are depends upon their availability no specific choice). 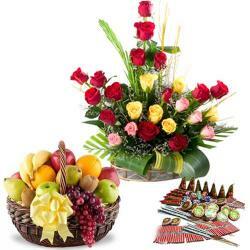 Diwali is round the corner and we are all set to jazz it up with unique gifts. 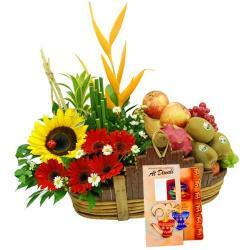 You need not worry as this is a hamper that is one of the most unique gifts to your dear ones for Diwali. With the fabulousness of twenty five flowers like Carnations Roses lilies tied into a beautiful bouquet and clubbed together with desirable crackers this hamper is all set to take away your dear ones heart this Diwali. 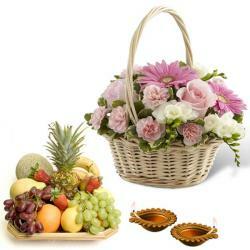 Make it special and big for your loved ones with gifting them something exclusive treat like seasonal fruits. 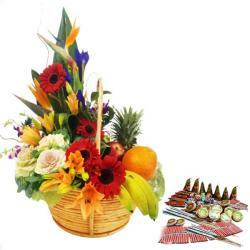 Product Includes : Basket of 25 Mix Flowers like Carnations Roses lilies with green fillers with 5 Kg Mix Seasonal Fruits in Basket along with Assorted Fire crackers (Worth Rs.300/-) (Note: Types of Fire Cracker are depends upon their availability no specific choice).